The Syrian civil war is a disaster of historic proportions that shows no sign of ending anytime soon. The latest figures suggest that it has killed nearly half a million people, making it the greatest catastrophe to hit the Levant since 1945, dwarfing earlier crises in terms of its human cost. But throughout all this carnage, only one country that borders Syria has managed to remain largely immune to the side effects of the war. That country is Israel. With constant fighting on the other side of the border, life in the Israeli-controlled part of the Golan Heights and in the Galilee goes on much as before the Syrian war began in 2011. This is not simply the result of good luck. It represents a quiet but notable success for an Israeli policy pursued over the last four years. This policy avoids taking sides on the larger question of who should govern Syria. Instead, Israel has sought to forge local alliances with rebel elements close to the border in order to prevent Iran and its allies from establishing a new platform for attacks on Israel, and keep Islamic State-aligned forces away from the border. So far, they have mostly worked. Jerusalem has also worked to strengthen the physical infrastructure on the border. It has reordered its military presence, invested in a new border fence, deployed drones and other means of electronic surveillance, and created a new Combat Intelligence Collection Battalion. 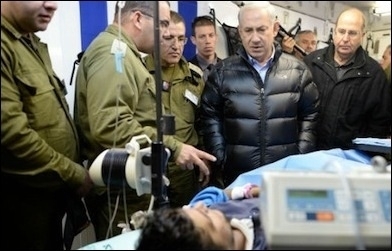 Israel has managed to remain largely immune to the side effects of the Syrian civil war. At the same time, Israel has acted on a number of occasions to prevent the transfer of sophisticated weapons systems to Hezbollah in Lebanon, and has probably carried out targeted killings on Syrian soil. With the Syrian war now transformed as a result of Russian intervention, it is an appropriate time to look at the emergence of this policy and the reasons for its success. The Israeli political and security establishments have been beset by differences over the Syrian war since it first broke out. Prior to the war, a powerful body of opinion within the country's defense establishment regarded the regime of dictator Bashar Assad as the "weakest link" in an Iran-led regional axis. The hope was that a blow could be dealt to the Iranians by tempting the non-Shia, non-ideological Assad regime away from its alliance with Iran and toward a pro-U.S. stance, mainly through Israeli territorial concessions on the Golan Heights. These assumptions were among the first casualties of the Syrian war. The support of Iran and Russia was clearly of central importance to the Assad regime. Unlike authoritarian regimes aligned with the West (Mubarak in Egypt, Ben Ali in Tunisia), the Assad regime was not rapidly abandoned by its patron at the first sign of serious internal unrest. Instead, Iran and Russia mobilized all necessary resources to preserve the regime, leading to the current situation in which Assad's survival in at least part of Syria seems assured. The Israeli political and security establishments have been beset by differences over the Syrian war. With the prospect of "turning" Assad no longer of immediate relevance, and with a coherent pro-American alliance no longer discernible in the region, the Israeli security establishment, like many others, first presumed that the regime's survival was unlikely. In late 2011, then-Israeli defense minister Ehud Barak predicted that the dictator would fall "within weeks" and welcomed his supposedly imminent departure. "The Assad family and its faithful have killed more than 4,000 people in Syria to date," he said. "It is impossible to know who will rule Syria in the future, but in any event, it will be a blow to the axis between Iran and Hezbollah." However, as Sunni Islamist and jihadi forces rose to prominence in the course of 2012-13, and Iranian and Russian assistance kept Assad in place, a "minority" view emerged. It held that the rise of Salafi jihadist forces among the Syrian rebels meant that the overall victory of the rebellion would not be in Israel's interest. It further posited that the Sunni Islamists had become the greater danger to Israel. This view failed to win the support of the policymaking elite. The Sunni Islamist threat was recognized, but the primacy of the Iranian threat remained. The result has been a synthesized view that goes something like this: Iran and its allies, of which the Assad regime in Syria is one, remain the most potent and dangerous threat facing Israel. As such, the primary goal of Israeli policy should be to prevent Iranian gains, and stop Iran and its allies from using the situation in Syria to improve their position against Israel. But given the nature of the rebellion against Assad and the forces dominating it, their victory could also be harmful to Israel. There is a danger that Assad's fall could produce a Sunni Islamist regime no less hostile than Iran, and perhaps more determined to act on this hostility. The fragmentation of Syria into rival enclaves is not necessarily bad for Israel. As a result, Israel has no incentive to align with or actively support the rebels. The Israeli establishment's strong aversion to interfering in internal political processes in neighboring countries – deriving from the institutional "trauma" of the unsuccessful alliance with the Lebanese Christians in the 1980s – has also militated against any overt efforts at backing the rebellion in Syria. Indeed, from a perhaps harsh but realist standpoint, the war itself, and in particular the fragmentation of Syria into rival enclaves, is not necessarily bad for Israel. However, the acceptance of the Syrian "status quo" should not induce excessive passivity. Rather, Israel should work to secure its border against spillover from the war, while actively preventing the Iranians and their allies from gaining an advantage. In addition, Israel needs to be aware of the smaller but significant threat represented by Sunni jihadi forces. These forces should be prevented from reaching the border, where they would be in a position to launch attacks against Israeli communities. Up to now, Israeli policy has been conducted along these lines. What practical form has their implementation taken? It is an open secret in Israel that the country maintains relations with Sunni rebel elements in the area adjoining the border in Quneitra Province. The reason is to ensure that they remain the dominant force on the border, rather than elements aligned with the Assad regime, Iran, or the Lebanese terror group Hezbollah. The Israeli policy of providing medical aid to Syrian civilians and wounded rebel fighters from this area is clearly an aspect of this policy (in addition to purely humanitarian considerations). The precise nature of the assistance afforded the rebels is not known. No evidence, however, has emerged of direct military aid. Given the great efforts to which Israel goes in order to ensure a clear intelligence "picture" of events in southwest Syria, it may be assumed that intelligence sharing probably forms part of the relationship. The rebels located close to the border are a mixed bunch. In the southern corner is Liwa Shuhada al-Yarmouk, a rebel group of long standing which is now clearly affiliated with the Islamic State. Israel has closely followed the movement of this organization in the direction of IS and is concerned about it. The relations between Israel and the group are hostile, though they have not yet resulted in open violence. There are Israeli concerns that a second rebel group in the area, the Harakat al-Muthanna al-Islamiya organization, may also be moving closer to the Islamic State. Israel has fostered small-scale cooperation with rebel groups regardless of their ideological sympathies. According to informed sources, Israeli contacts with rebel elements close to the border are not limited to the Western-supported rebel coalition called the Southern Front. They also include elements sympathetic to and affiliated with Sunni Islamist groups. Israeli sources note that the rebellion is a fragmented, localized phenomenon. As such, it has been possible to foster small-scale cooperation independent of the broader ideological sympathies of these groups. As a result, one former senior security official described the area east of Quneitra Crossing as a "virtual security zone" for Israel. The delicate and sensitive nature of such relationships is obvious. But nearly five years into the Syrian civil war, the success of this policy speaks for itself. As of today, with the exception of the small area controlled by Shuhada al-Yarmouk in the south and another small area controlled by the regime in the far north, the greater part of the area abutting the Israeli border is in the hands of non-IS rebels. And these groups, thus far, have not mounted cross-border attacks on Israel. Furthermore, according to media reports, Israel's influence over the rebels in this area has been used to prevent a small pro-regime enclave in their midst, the Druze village of el-Khader, from being harmed. The fact that the residents of el-Khader are themselves fanatically hostile to Israel adds another layer of irony to this complex reality. Israel's influence over Sunni rebels has prevented Hezbollah and other pro-regime forces from threatening its borders. This quiet policy of cooperation, which has kept the Iranians, the regime, and Hezbollah away from the border, has of course been accompanied by more kinetic action on the part of Israel. This has included action close to the border to prevent Iranian-led attempts to construct infrastructure to facilitate attacks on the Golan Heights. The January 2015 killing of Hezbollah terrorist Jihad Mughniyeh, along with IRGC Colonel Ali Reza Tabatabai and a number of Hezbollah operatives in an area close to the border, was the highest-profile demonstration to date of Israel's willingness to act directly to frustrate Iranian intentions in this regard. The death of Samir Kuntar in the Jaramana area of Damascus alongside a number of other Hezbollah operatives may be another example of Israel's "long arm," though Syrian rebels also claimed responsibility for the attack. Israel does not claim responsibility for attacks on regime, Iranian, or Hezbollah weapons convoys on Syrian soil. But it is likely that Jerusalem has been responsible for a number of attacks of this kind over the last half decade. Such actions are intended to prevent or disrupt the transfer of weapons systems across the border from the regime and Iran to their Hezbollah allies. 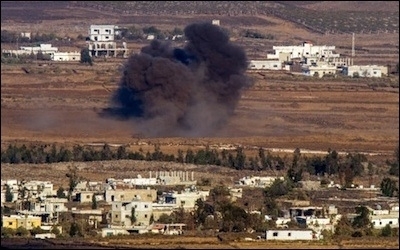 These attacks have taken place over regime heartland areas including the Damascus area, the Qalamoun mountains region, and on at least one occasion in Lebanese territory. While Israel does not comment on specific incidents, Israeli leaders have made clear that they will act to prevent Hezbollah from obtaining "game-changing" weapons technology. In April 2015, Defense Minister Moshe Ya'alon stated openly that Israel would not permit Iran to arm Hezbollah with advanced weapons systems. Of course, it is much harder to measure Israeli success in this regard. The quiet on the border, however, is testimony to at least some success. With regard to weapons transfers, it is impossible to independently assess what weapons systems may have passed into Hezbollah's hands. A conclusive answer to this question will become available only in the event of a new war between Israel and the terrorist group. However, the ongoing engagement of Iran and Hezbollah in the Syrian war itself provides an inadvertent benefit to Israel. Hezbollah probably has around 10,000 fighters deployed in Syria at any given time. The movement has lost over 1,000 dead in the war. Hezbollah has forces deployed in the northern Bekaa area to hold off the ongoing possibility of cross-border attacks by Sunni forces. With all this to deal with, renewed aggression against Israel may well be a luxury the movement is currently unable to afford. Russia's direct entry into the Syrian civil war on September 30, 2015 appears to have ended the long stalemate. As of now, regime, Iranian, Hezbollah, and allied forces are moving decisively against the Sunni Arab rebels in Aleppo province. The regime has also made gains further south in Hama and Deraa provinces. Bashar Assad made clear in an interview in February 2016 that his intention is to eventually reconquer the entirety of the country. It appears that the goal of the regime and its allies is to eliminate the non-IS rebellion and secure western Syria, along with the majority of the country's population, for the regime. This raises the possibility of the regime's eventual return to Quneitra province, which would also imply the return of the Syrian army to the border area. While such an eventuality cannot be ruled out, it should be noted that it does not appear imminent. The regime will need to complete the reconquest of Aleppo and Idleb provinces before such a task can be contemplated. This remains a mammoth task that is only now beginning. The rebellion has proven tenacious and hard to uproot over the last half decade. Russian air power of course enormously increases the regime's strength. But the old situation in which the regime is able to reconquer areas but then proves unable to police them remains in effect. When it comes to pacifying reconquered areas, air power will be of limited use, unless the regime wishes to simply depopulate the area in question. So while the regime's return to the border area cannot be ruled out, it does not appear imminent. A deconfliction regime appears to be in effect between Russian and Israeli air power over Syria. It is no less important that Israel has been careful to maintain communication with the Russians, and a "deconfliction" regime appears to be in effect between Russian and Israeli air power over Syria. Prime Minister Benjamin Netanyahu, IDF Chief of Staff Gadi Eisenkot, and Military Intelligence chief Herzl Halevi travelled to Moscow immediately following the Russian intervention, presumably to lay the groundwork for a channel of communication. As of now, this appears to have permitted Israel to continue to operate in the skies over Syria. Thus, while the emergence of a fledgling Russian-Iranian strategic alliance in the Middle East is surely of concern to Israel, the evidence to date suggests that the alliance by no means implies carte blanche for the Iranians to pursue all their regional goals under the umbrella of Russian air cover. On the contrary, the Russians, as the senior partner in the relationship, dictate when and to what extent cooperation takes place. 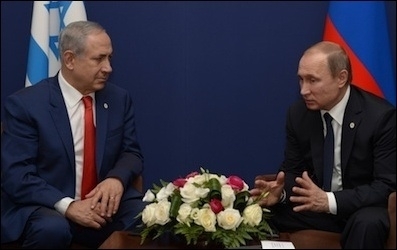 Netanyahu, according to the Times of Israel, told Russian President Vladimir Putin in "no uncertain terms" that Israel would not tolerate Tehran's efforts to arm Israel's enemies in the region, and that Jerusalem has taken and will continue to take action against any such attempts. The Times quoted the prime minister saying, "This is our right and also our duty.... There were no objections to our rights.... There was readiness to make sure that whatever Russia's intentions for Syria, Russia will not be a partner in extreme actions by Iran against us." Israel appears to have taken at least two actions over Syrian soil since the Russian intervention, indicating that, for now, the agreement appears to be holding. Nevertheless, given Israel's general satisfaction with the situation east of Quneitra under the present arrangement, Jerusalem will no doubt be watching the situation carefully and with some concern regarding the possible return of the regime and other Iran-backed forces to the area. In this regard, it should be noted that Russia and the Assad regime's stance on current efforts toward a ceasefire include the demand for the exclusion of "terrorist" groups. Thus, even if the efforts were to reach fruition, it is unlikely to have a major impact on Russian-backed regime efforts to reconquer rebel-held areas in the southwest of the country. Israeli policy with regard to the Syrian civil war offers an example of modest, pragmatic aims pursued with a notable degree of success. Israel is now the only state bordering Syria that has not suffered major fallout from the war. Iraq and to a lesser extent Lebanon have seen the war erupt on their own soil. Jordan and Turkey have been faced with a wave of refugees and, in the latter case, the return of a Kurdish insurgency. Israel has managed, thus far, to avoid all of this. Given the massive, historic dimensions of the events taking place in Syria and Iraq, this represents a significant achievement. A few kilometers from a conflict in which nearly half a million lives have been lost, normal life is going on unimpeded in the Israeli and Druze communities on the Golan Heights. The lesson for other countries may well be that a sober, pragmatic, realist policy, with clearly set aims and absent grand ambitions for the reshaping of other societies, offers the best route toward success.